This summer I was feeling very happy because finally I had enough free time to make one recipe I had in mind from a new cookbook (because I could eventually seize the moment to get my hands on it!). But my happiness soon turned into frustration when I found out that my stepdaughter had developed an allergy to the main ingredient! An allergy to raw bananas, which were in fact one of the essential ingredients, that contribute to the creamy texture. So imagine you already have all the ingredients on the kitchen table, your kids are ready to get their hands on the dough, and suddenly you hear your 15-year-old teen saying “but you do remember that I am allergic to raw bananas?” . That is the same as saying, “I am going to work hard in a recipe that I won´t be able to taste”… Ok. To start off, I thought, let´s change the mood, let´s play to ludo and see if I can come with something else. A shift in action always helps. While we were playing with the dices, it dawned on me…. MANGO! Even with all the changes I made, the recipe came out perfect and was family approved. 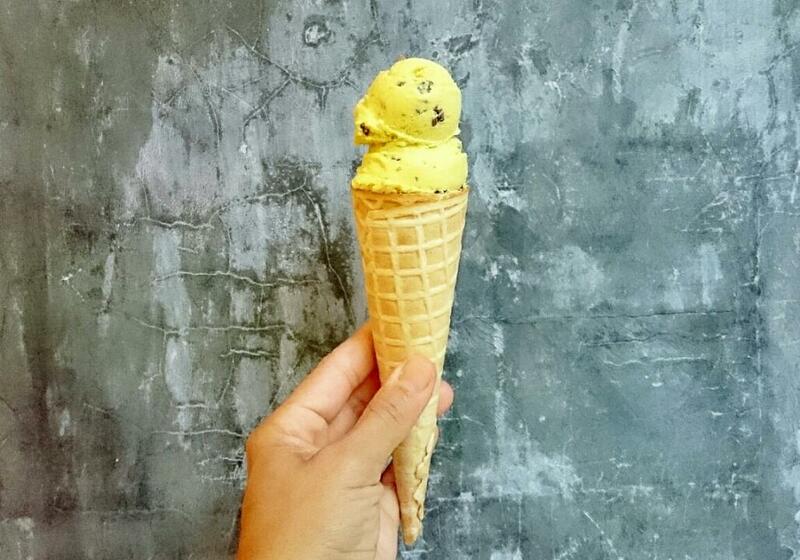 An ice-cream without dairy products? And without sugar? Yesss! I love seeing my husband´s surprised face (a traditional pastry chef is always surprised at things like this!). I wanted to post it and share it with all of you in the blog that same week, but I thought it would be a good idea to wait for the start of the season in Spain. 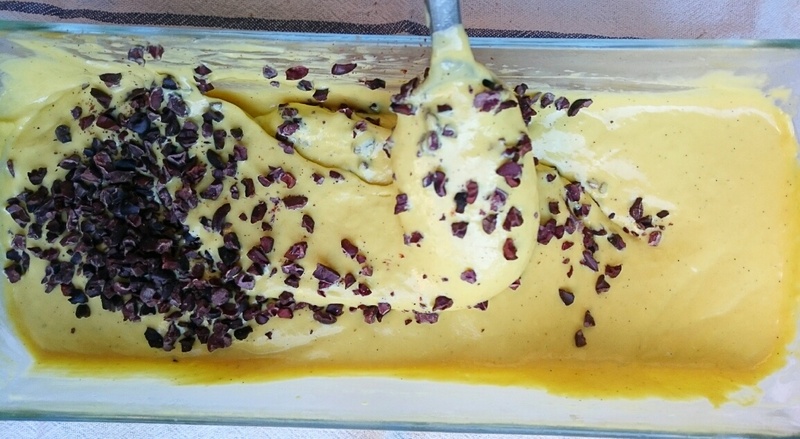 I made the same recipe again a few days later but the mangoes were not that good and the result wasn´t so delicious. And so, now that the mango season in Malaga has begun and you will be able to find them in the optimal ripening point, it is time to make the recipe. 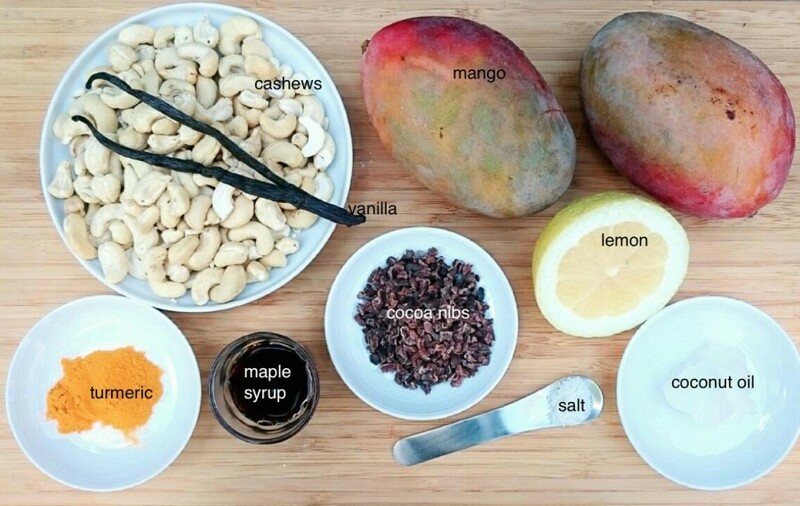 And if you find really delicious mangoes, invest a bit, buy a whole box and freeze them (once you have peel them and cut them into pieces) so you have them ready at home to prepare a shake, a sauce or whatever it comes to your mind. I already ordered one whole box in the market this week! Soak the cashews in water for about 4 hours. Put inside the freeze the mould where you are going to place the ice cream. I prefer the Pyrex glass type . If you have an ice cream maker, you can also use it. Cut and peel the mango, cut it into pieces and freeze it after spreading out over a tray with parchment paper. (This step is optional, but it will improve its creaminess when it comes to grinding it). Strain the cashews and grind them together with the water, the maple syrup, the lemon, the vanilla, the salt, the coconut oil and the turmeric. You will need to stop the machine several times to be able to bring everything towards the center with the help of a spatula. When you start to get a sort of cream, add the mango and mix everything together until you get a creamy texture. (You can keep it like that in the fridge, and eat it later adding some cocoa nibs on the top). 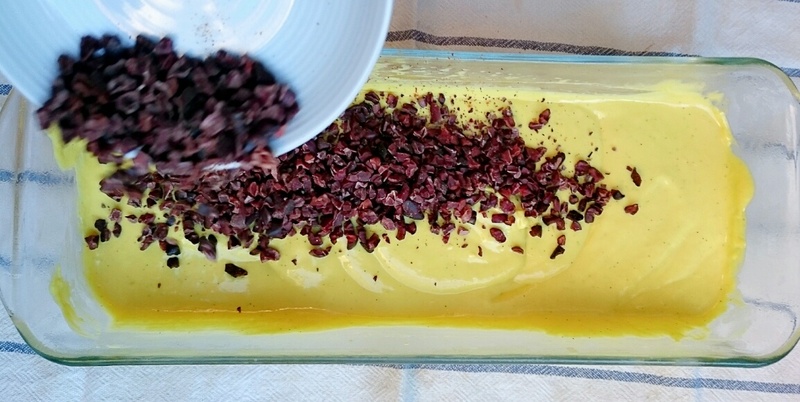 Pour out the mix over the mould you had in the freezer, add the cocoa nibs and turn everything around several times with the help of a spoon to make sure that everything gets well mixed up. Put it again in the freezer. Stir it well after one hour and place it again in the freezer. Do it twice, every two hours, or until you see that it has got the consistency of an ice cream. You can taste it at that very moment or leave it in the freezer. If it gets very hard, you will need to take it out of the freezer at least 15 minutes before eating it.